The conference provides an excellent opportunity for networking and growing your various businesses; however, what I love most about it is that it gives me the opportunity to connect with old friends and make new ones. During last year’s conference, I met Melanie from Dear Debt in person; and she became an instant friend of mine. This year we were roommates and I couldn’t have picked a better roommate. We have similar personalities, hustled hard and giggled ourselves to bed just about every night. I also got to meet Tonya from Budget and the Beach and Mrs. Frugalwoods for the first time in person. Including Melanie, the four of us record the Happy Hour episode for my podcast every month; and it was such a pleasure to experience the joy of happy hour together with each other. Everywhere I went, I ran into familiar faces and it felt like the best reunion possible. Even bloggers I met for the first time felt familiar since we know each other so well from our online presence. It’s such a gift to see all of these people in one place. During the conference, I made a number of connections with various companies and bloggers, and I can’t wait to see where these relationships will lead. One of the great things about being an entrepreneur is making connections with people and discovering new business opportunities as a result. I met a number of people through a two-hour networking event; and despite the fact that it was a crazy speed dating experience, I was inspired by a number of the companies and potential ways that we can work together. We had the opportunity to record the Happy Hour episode of the podcast live from the podcasting stage at FinCon (it will come out on this Friday’s podcast), which meant that we would have an audience. 21 podcasts recorded live from the stage over the course of the conference and most just had people walk by briefly and check out what was happening. There were a few that had no audience whatsoever. During the Martinis and Your Money recording though, there was a crowd of a few dozen people on and off with a little more than a dozen staying for the entire episode. While we were recording, I looked at the crowd gathered to support us and I felt joy and gratitude for them. Many in the group encouraged me to start the podcast at FinCon last year and promised me that they would support a show if I created one so it was overwhelming to watch them hold true to their word. The last night of FinCon is always the Plutus Awards ceremony. 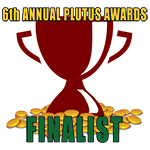 The Plutus Awards celebrate the best of the personal finance community and are ultimately voted on by a panel of bloggers. Last year, I was a finalist in two categories, Best Financial Planner Blog and Best Designed Blog, and I lost both to one blogger. I was disappointed at the loss, but quickly got over it by celebrating in loser fashion with my friends. This year, I was a finalist in the Best Personal Finance Podcast category; however, I had a lot of stiff competition, and since my podcast is relatively young, I assumed I had no chance of winning. I was comfortable with what I felt was an inevitable loss as I was truly thankful just to be nominated. A number of my friends were nominated, though, and I really wanted to see them win. The award show kicked off and I quickly watched as my friends walked up to collect their trophies; and I was so proud and happy for them that I felt as though I had one too. I know how hard they all work and I loved watching them get the recognition that they deserve. Finally, my category came up and I sat there and waited to hear the So Money podcast announced as the winner that I was shocked when they said “Martinis and Your Money.” Even as I write this, I can’t believe they said it. My friends stood up and cheered and I walked to the stage barely able to breathe. It was such a surreal moment for me to think about the fact that I decided to start my blog during the Plutus Awards Ceremony at FinCon last year and just one year later, my podcast beat out dozens of other podcasts to win. I am overwhelmed by the support and vote of confidence from the personal finance community that I love so deeply. It was truly one of the more amazing nights of my life, and I thank every single person who voted and supported me. You made me happy beyond words and I am thankful for you. Did you attend FinCon? What made you happy during the conference? If you didn’t attend, what makes you happy in general? Shannon it was so great to meet you in person! I am still overloaded and processing all of the ideas and connections I came away with. Very cool to be there. HUGE congrats on the win, Shannon – you SO deserve it! Glad you had a great time at FINCON – it sounds like so much fun! You know what else is fascinating to me about FinCon – how many other conferences do you think are out there where total strangers go “sure, let’s share a hotel room”? I can’t imagine that is a common thing anywhere else. Ugh. I’m so bummed I didn’t make it this year. Congrats on the win Shannon! Great to finally connect with you and all the ladies of the Happy Hour. So much fun! Whoo hoo! Congrats again on a successful fincon, the Plutus award, and all of the other successful things I know are yet to come in your life! It was so great to meet you in person! I’m really thankful that I had the opportunity to attend FinCon. I met a ton of great contacts for my freelance work (which is why I went), but I also had a fun time which was rather unexpected for me. I usually hate attending conferences (because I tend to be awkward and sleepy), and I have often expressed to my boss that a Udemy course would be 15X more valuable than a conference at 1/10th the cost. However, FinCon is going to remain an exception to the rule in my book. The content was great, and the people are even better (and also have an appreciation for live tweeting). Congrats Shannon!!! I started following your blog a few months before FinCon Last year and even more so since the Podcast started. Your personality and the guests you bring to the show are Fun!!! The content you bring to the show is GREAT and very relevant to lots of people!! You have a dedicated listener here!! Great work doing what you love!!! I was so happy to meet you, Shannon! Congratulations on your award and a fabulous session on podcasting. What a year for you! Way to go. Congrats on the Plutus Award! So well deserved! We were shocked to be nominated, and had major FOMO for not attending FinCon. 🙂 But we’re definitely convinced that we need to be there next year! Love your blog and podcast, so keep up the great work! Congrats! It’s so fun to see the powerful ladies of persona finance getting the recognition they deserve. I have had several career situations recently that have made me happy. I hope to be able to share those soon. My family and Colorado in the fall make me very happy as well. Okay, Holly messaged me and I’m buying a ticket to FinCon 2016 this week! I haven’t been to a FinCon and I really need to go. I was so jealous seeing all the pics on my newsfeed during the conference. Kudos to you for getting a crowd for your podcast. I’m not gonna lie, I feel bad for some of the other podcasts that didn’t get a crowd or audience. Podcasting seems incredibly difficult so it had to be discouraging not to have a crowd. But I’m not surprised you had one and I was showing my wife pics of the martinis you were giving out! The song Happy is perfect for you! Congrats! You really deserve it, Shannon. Cheers! Shannon – so proud of you on your PLUTUS win. So well deserved. I love seeing women succeed in Finance. You are an inspiration. To anyone considering going to FinCon16, I HIGHLY recommend it. We were last second attendees, and I can’t believe what an amazing community it is. Here’s to a pink martini next time we are together! Congrats again on your award! Congrats on the big award, as podcasting is only getting bigger with time. No pressure for next year of course. LOL. I was bummed I couldn’t make it this year. Hope to meet you soon 1 day. I was so happy to see you and everyone else win a Plutus! The energy in that room as the winners were announced was crazy. We were all so supportive of each other, and I love that. You (and everyone else) have worked so hard this past year, and totally deserve it. Just being able to meet everyone and reconnect with those I met last year made me pretty darn happy! Epic event as always! Great seeing you there! I wish I was there to meet all of you especially you Shannon. Congrats on the award. You truly deserved it. I had the BEST time with you!! It was so fun to meet you in person too!!! You’re so right–it felt like a huge reunion, even though I hadn’t met most people in person before. Funny how that works ;). Can’t wait ’til next year!